1. Plastic Behaviour and Limit Analysis of Plates. Plastic deformation of plates. Plastic bearing moments per unit length of plates. Fundamental relations and principles of limit analysis of plates. Equations of equilibrium of plates. Various yield criteria for plates. Some topics of statical and kinematic solutions. 2. Rectangular Plates with Hinged Supports. Uniformly loaded, orthotropic, rectangular plates with edges supported by hinges. Uniformly loaded rectangular plates with hinged supports along three edges. Uniformly loaded rectangular plates supported on two opposite edges. Rectangular plates with a triangular load distribution. Rectangular plates with a trapezoidal load and hinged supports along the periphery. Uniformly loaded rectangular plates with the point load in the centre. Uniformly loaded, long, rectangular plates with a point load and supported along the opposite short edges. Uniformly loaded. Wide, rectangular plates supported along two opposite edges and with a point load. Static solutions for the ultimate loads on rectangular plates. 3. Yield-Line Planning for Rectangular Plates with a Concentrated Load. Ultimate concentrated load applied in the centre. Ultimate point load eccentrically applied to rectangular plates on hinged supports. 4. Polygonal, Circular and Elliptical Plates; Plates of Special Forms. Isotropic polygonal plates with straight yield lines. Isotropic polygonal plates with yield fans. Uniformly loaded polygonal plates with yield fans. Singular yield-line patterns of polygonal plates. Orthotropic polygonal plates. Regular polygonal, orthotropic plates with yield fans. Plates with curvilinear boundaries. Circular plates with hinged supports. Elliptical plates with hinged supports. Polygonal plates with rounded corners. A uniformly loaded, polygonal plate supported at the corners by columns and with a point load in the centre. Uniformly loaded circular plates supported on the peripheral columns with a point load in the centre. Plates with overhanging boundaries. The statical solution for the bearing capacity of polygonal plates. 5. Built-In Plates. Uniformly loaded, rectangular, built-in plates. Uniformly loaded. Orthotropic, rectangular plates built-in along three edges. Uniformly loaded, orthotropic, rectangular plates with built-in and hinged edges. Built-in plates with uniform and concentrated loads. Rectangular plates, built-in along three edges, with uniform and concentrated loads. Statical solutions for the bearing capacity of rectangular, built-in plates. Built-in, polygonal plates. 6. Skew Plates. Elementary solutions for skew (parallelogram) plates on hinged supports. Hinged-supported, skew plates with yield fans. Ultimate uniform load of skew plates with hinged supports along three edges. Skew plates with hinged supports along three edges and with yield fans. Skew plates supported on two opposite edges. Uniformly loaded, skew plates with hinged supports along the periphery and a point load in the centre. Built-in skew plates. Experimental investigation of the skew reinforced-concrete plates. 7. Plates with Free Supports. Regular polygonal plates. Uniformly loaded, rectangular plates with free supports. 8. The Bearing Capacity of Plates with Shear Effects. Shear effects determined by the kinematic method. Shear effect in the statical method. 9. Continuous Rectangular Plates. Uniformly loaded, continuous, rectangular plates with peripheral hinged supports. Inner fields of orthotropic, continuous rectangular plates with yield fans. Continuous rectangular plates with free edges. The boundary fields with yield fans. Continuous rectangular plates with uniform and concentrated loads. The static method for the limit analysis of continuous rectangular plates. Mushroom plates. 10. Continuous Skew Plates. Uniformly loaded, continuous skew plates with peripheral hinged supports. Inner fields of continuous skew plates with yield fans. Continuous skew plates with free edges. The boundary fields of continuous skew plates with yield fans. Bibliography. Index. 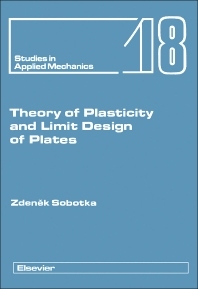 An extensive review of the theory of plasticity, limit design and limit analysis of plates is contained in this volume. Detailed descriptions are given on the plastic behaviour of homogeneous, reinforced and sandwich plates, and on the rise of various yield-line patterns. The volume differs from other books on the plastic analysis of plates by its comprehensive treatment of: the theory of yield fans connected with yield-line planning; the plastic behaviour of plates under combined loadings characterized by the load factors; statical solutions; and continuous, rectangular and skew plates. Before discussing the upper-bound solutions for various types of ultimate loads acting on isotropic, orthotropic and anisotropic plates, the kinematic conditions of the plastic behaviour of plates and the principles and methods of the yield-line theory are examined in detail. Generalized yield conditions of the second degree for orthotropic and anisotropic plates are introduced. Special attention is paid to the rise of yield fans. The concept of yield line planning is also discussed, which may be of practical interest since it indicates the possibilities for preventing the rise of yield fans. Upper-bound and lower-bound solutions for the ultimate uniform load, concentrated loads, triangular and trapexoidal loads, are presented. Similar solutions are provided for continuous loads bounded by various plane and curved surfaces and for various combinations of loads acting on rectangular, polygonal, circular, elliptic and skew plates. Solutions are given for plates on hinged supports, on free supports with elevating corners, on point supports and also for plates with built-in edges. Numerical tables are provided for determining the ultimate loads, bearing moments needed for the given load systems and the parameters of yield-line patterns. The procedures detailed in the volume will prove an indispensable reference source in the practical design of roof, ceiling and bridge slabs.